10 weeks to choose from between May 28th thru Aug 2nd! Our facility is NOT open to the public during Camp hours. Rest assured your child is safe and secure in our clean and security-monitored facility at all times. 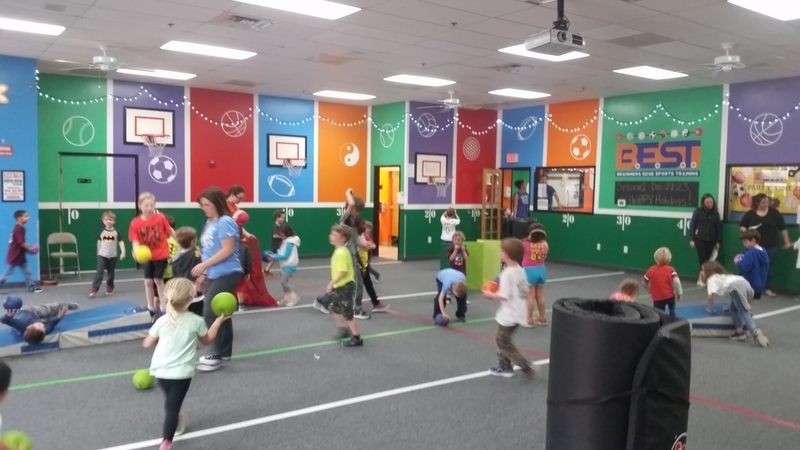 Approximately 85% of our day is playing active sports in our clean, safe & air-conditioned 4,000 sq ft PartyZone facility! Please note that some camp sessions may be 4 or 5-Days in length (depending on Holidays like Memorial Day & Independence Day). Please click on the camp logo above to REGISTER. Full, half and single days are always available. Remember to sign up early as we sell-out EVERY year. Sibling discounts & Multiple Camp discounts are also available, so the more you camps you enroll for, the more you save! ***Early-bird Pricing** is reflected online while registering ENDS on Sun April 21st @ midnight. Snacks: B.E.S.T. will serve fresh fruit for morning and a starch afternoon snack as well (such as freshly popped popcorn, animal crackers, or goldfish) daily. This has been cleared as a nut free snack by all who have been concerned. We encourage you to pack one snack for half day campers and 2 snacks for full day campers if your children are picky. Catered Lunch: Full-day/full-week campers will receive a fresh catered lunch. Our catered lunches are available for the entire week, Monday thru Thursday. (Pizza Friday is included for full-day/full-week campers.) Our Catered Lunch comes with a fresh sandwich, chips, pickle and small cookie. We will be eating lunch every day between 11:30am-12:30pm depending on your age group. Please supply your child with a sack lunch daily with their name on the sack along with an ice pack inside if they are picky eaters. We are unable to accommodate alternative or substitute lunches for the reasons of allergies or personal preference. A.M. HALF DAY KIDS: Many of our half-day AM kids are still “littles”, still nap and don’t make it home without falling asleep in the car. Our youngest campers will be eating lunch with us for FREE and our NEW pick-up time is at 12:30pm! This allows them to be fully fed and not cranky hungry on the way home. Drinks: Water is the only beverage we supply each day. Your child’s water bottle will be replenished with bottled water throughout the day (and is also available through our filtered water fountain/hydration system) so they always remain hydrated. ** SAFETY IS KEY: If the above forms are not turned in your child can not participate. ID will be checked daily at pick-up time. No exceptions.Waiver forms are kept on file for 1 calendar year. YOUR CHILD MUST BE BATHROOM INDEPENDENT. What does this mean? This means that they must be able to go to the bathroom (get on and off the toilet) on their own and flush and wash hands by themselves. We will not enter into the bathroom facilities with your child, and should they have an accident they will have to change themselves. Should they not be able to change themselves you will be called to come to assist. Pull-ups are not permitted. Should a change of clothes be required we will supply a t-shirt and sweats/shorts and socks for $25. This is non-negotiable should you not pack a change of clothes.